Can Everett capture a second state title in a row? The Tide has plenty of new faces since last year, but still plenty of championship caliber talent. We finish our series of MIAA state championship previews with the largest and smallest divisions in the Commonwealth. For any of our past previews, click below, and continue on for breakdowns of Everett vs Xaverian and Hoosac Valley vs Millis. Everett (11-0) vs. Xaverian (8-4), Saturday 8 p.m.
With the most dangerous offense in the state and one of the best secondaries in the entire country, Everett enters a Super Bowl rematch with Xaverian as the prohibitive favorite. These powerhouse programs have met in the state finals six times, including three times over the last four seasons alone. 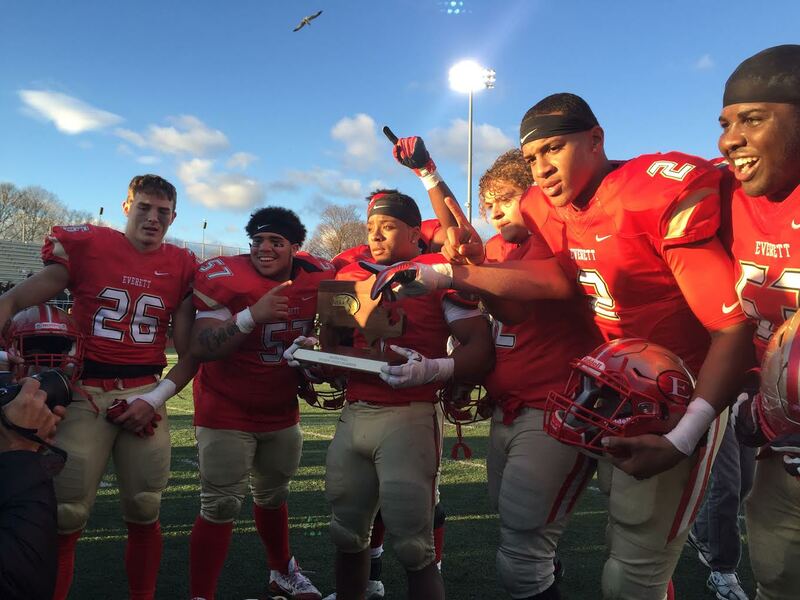 Everett beat Xaverian, 21-7, in 2016 and the Hawks came out victorious with a 38-29 win in 2014. 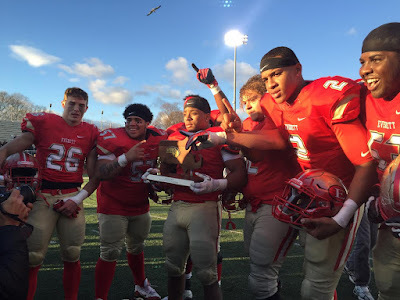 The Crimson Tide rolled Xaverian, 35-7, at Everett Memorial Stadium to open the year and have blazed past the competition since then, averaging 44.3 points per game, with their closest call coming in a 37-29 win over Central Catholic in the Division 1 North final. Junior quarterback Jake Willcox (25 passing TDs) is the triggerman behind Everett’s elite spread attack, and he has a host of weapons to target in wide receivers Anthony Norcia (5 total TDs), Jason Maitre (9 TDs), Mike Sainristil (11 TDs) and Malden transfer Isaiah Likely (9 TDs). Everett’s ground attack is an elite complimentary weapon, led by Jacob Miller (6 TDs) and supplemented by Brighton transfer Kevin Brown (8 TDs). While Xaverian’s defense didn’t offer much resistance in a season-opening loss to Everett, the Hawks have come together on that side of the ball, allowing just 5.1 points per game while winning six of their last seven contests leading into the Super Bowl. Yale-bound safety Brian Abraham leads a secondary that will have its hands full in this matchup, but he’ll have help on the outside in all-around weapon Cooper DeVeau (6 total TDs). DeVeau plays wide receiver, corner and is a dynamo on special teams for Xaverian, complimenting a run-heavy offensive approach led by running back Ike Irabor (14 TDs) and power back Michael Saliba (6 TDs). Hawks quarterback Davin Sweeney can deliver the ball when asked, but the Hawks will likely look to slow the game down by keeping it on the ground and not testing Everett’s speedy secondary. Led by safety Lewis Cine, the top-ranked recruit in Massachusetts for the Class of 2019, Everett flies to the ball and shuts down almost all plays designed to get to the edge. Maitre plays alongside Cine at the back end and Linebacker Duane Binns leads the Crimson Tide in the middle of the field. Xaverian faces an uphill battle against a team ranked eighth in all of the Eastern U.S. according to USA Today’s latest poll, but the Hawks likely won’t fold easily on the grandest stage. Millis (11-1) vs Hoosac Valley (11-0), Saturday 1:30 pm. Millis has been here before. Well, not here exactly, because the Mohawks won their Division 4A state championship against Maynard at Worcester State last season, but there's no doubt this team is ready for a big stage, even one the size of Gillette Stadium. With 17 seniors back from that championship squad (on a team of only 28), experience and talent make up for a slight lack of depth. But, despite a lack of numbers, the Mohawks have been able to absorb losses in the backfield, and along the offensive line. Up front, super soph Kevin Pyne has been out with a knee injury, while star running back Kurt Hopkins missed time last month with a bum elbow. Even in Pyne's and Hopkins' absence, the Mohawks consistently won the battles in the trenches, and gave star quarterback Bryce Latosek plenty of time to spread the ball around. Since the return of Hopkins, Millis' offense has balanced out, making the Mohawks even more lethal in coach Dana Olson's spread. Defensively, though, Millis will have its hands full with an unusual Hoosac Valley offense. The Hurricanes are putting up points galore, thanks to their patented Flex-Bone attack, most recently in a 76-34 state semifinal win over Nashoba Valley Tech. While many play makers occupy the Hoosac backfield, it all starts with quarterback Vance Eugene. The senior has been lethal as a decision-maker, runner and passer this year, pressing all the right buttons on his way to nearly 900 yards passing and 530 yards rushing, to go with 26 total touchdowns (13 rushing, 13 passing). Nobody is going to confuse the Hurricanes with a high-flying passing offense, but Eugene's arm forces defenses to stay honest, and opens up lanes for himself and star running back Matt Hall as well. This one has the makings of a shootout, but don't be surprised if a defensive back or pass rusher makes the game-deciding play.